If your starting a dorsal Finn goalie on nhl 19 GET HIM TO THE LA KINGS PLEASE! More more more more more please 🙀!!!!!!!!!!!!!!!!!!!!! You have 2 comebacks now, keep it up and Finntastic! Love your content. One thing I would say is maybe reading the defense more before you hike the ball. Especially on all pro the defense lines up in what they are running! I used to hate the game until I started noticing the defense and starting pick it apart! Keep the vids up man! 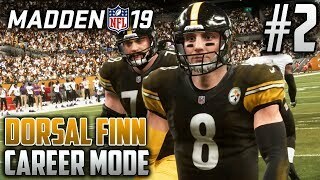 In the create a player mode, do they give you an option to choose your facemask? FYI that Connor kid is a rookie and he beat cancer in college!